Ernest is referred to a couple of times in the Social Chess Quarterly in a manner that suggests that he was an active member of its associated club. Andrew's family say, though, that EMJ was a working man; which, on the face of it, contradicts my rather glib presumption in the last episode: that the ESSC, with its opening times of 10.00am to 6.00pm weekdays (no weekends) and a location in the upper-middling milieu of Whiteley's department store, would have appealed only to those with a lot of free time on their hands (and nothing else to do with it but to play chess). EMJ was not, though, a man of leisure. He was a buyer for another department store, Morley's in Streatham S.W. (though living in north west London), and so he, too, would have been unlikely, I would have thought, to be gone chessing at Whiteley's in normal office hours. On the other hand his status as staff in one department store might have made him feel comfortable in another - a home from home - if the opportunity arose. Indeed there is a photographic suggestion that he was in at the ground floor, as it were, of the ESSC: the inauguration in September 1930 of its new club-room adjacent to the 4th floor restaurant at Whiteley's. Take a look at this murky picture of that ESSC foundation meeting, and the circled figure on the right. This is 20 years on from the Hampstead CC photograph shown at the top of this post, and any likeness between those two is, admittedly, not obvious. Compare instead the 1930 red-circled snap with the crop of EMJ taken from a photo of a Hampstead team trip to the continent in the nearly contemporaneous year of 1927. EMJ. Definitely in 1927 (left). 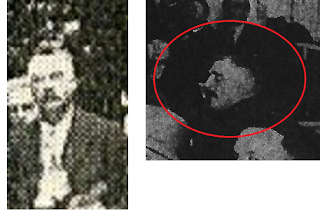 Maybe in 1930 (right). Still not convinced? Well, we don't need to rely on these grainy images to show that EMJ was an active Empire man in the club's golden years. In July 1932 (ESQ Vol 2, No. 8 p.177) he showed up in a match between Empire and Imperial CC's - with a Golombek v Sultan Kahn clash on Board 1. It was: "an exciting Caro-Kann with a sacrifice of a piece, which enabled Sultan Khan (white) to force a win." (Unfortunately, I didn't notice the game score in the ESQ, nor could I find it elsewhere). Jellie was referred to as one of several "well-known players in the match", which Empire won 12 v 9 with EMJ beating Dr.V.H.Rutherford on board 4 (according to the Singapore Press 20 July 1932, which as a colonial paper seemed to have taken more than a passing interest in the Empire SCC). Especially telling though, for the Jellie/ESSC connection, is that in April 1935, he is reported by the SCQ as winning the club's winter competition - a "special Bird's Opening Tournament". This shows EMJ as a decent enough player to win an ESSC tournament, albeit a less than serious one, and the Club as enterprising enough to stage such a thing in the first place. 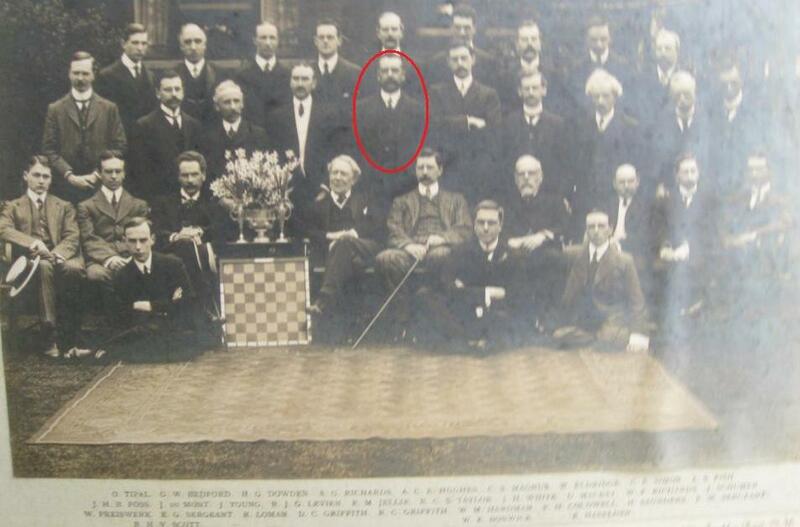 There is a very helpful biographical note about Firth on the Yorkshire Chess History site by Stephen John Mann, to which this section of the post is indebted, and to which we can add some further detail. Stephen dates his birth to 13 February 1862 in Sheffield, and in a splendid bit of sleuthing ties Firth into the creation of a spa-hotel, the "Craigside Hydro" near Llandudno, in the late 1880s. This was to become the venue for a series of amateur chess tournaments in the 1890s, of which the 1897, and '98 editions were the last gasp of the Reverend Arthur Bolland Skipworth's Counties' Chess Association (see also Tim Harding's EVCP pp 151-3). The Reverend Skipworth himself gave up the ghost in November 1898, and the CCA went to the grave with him. Shame he didn't stick around longer: a divine intercession from him may have been the salvation of Firth's daughter Violet (b 1890) who morphed, alarmingly, into the magician and occultist Dion Fortune. Thanks to this astrology blog we know that when Violet - aka "Miss Fortune", by any chance? - died on the 8th January 1946 the planetary alignments were such that "the primary directions for the year show Ascendant opposite Mars, in the secondary progression her Ascendant squares the natal Mars": which is more than can be said for her father for whom no date of death is given by Stephen Mann (though various family trees on Ancestry suggest it was in 1943, but without any further clarification). During the 1890s Firth seems to have been the Secretary of the Craigside Hydro Chess Club, and involved with the administration of some, at least, of the Craigside tournaments, So, in that capacity he can be found publicising the fourth tournament in June 1895 (in the Liverpool Mercury 11 May 1895), and later we find him receiving the entries for the January 1899 tournament (Dover Express 23 Dec 1898). There was yet one more after Skipworth's death - held at the end of 1900 with the Rev '1...b6' Owen, W.H.Gunston, and Amos Burn on the Committee (Evening Standard 19 Dec 1900). In the 1901 census Firth comes up as "Ferth", an "employer" living at, and possibly running, a "club" - possibly a "hydro-therapie establishment" - in Sheen Lane, Mortlake in South West London, with his wife's parents as the management. By 1911 Firth, Sarah Jane his wife (née Smith, they married 19 August 1886), and Violet (now an "author") were in Kensington, with two maids and a cook; he gives his occupation as a solicitor. So, "Social chess" - the Firth trademark - and the Craigside Hydro again; but Firth, now on the threshold of the SCQ/ESSC venture, may already have been living in Letchworth - a popular new "Garden City" within commuting distance due north of London - the address he gives in the Social Chess Quarterly. He must by now have been cultivating his connections with Whiteley's and hatching his "Social Chess" project (and quite possibly keeping warm his connections to such chess still alive and kicking in Llandudno - see this, in the Falkirk Herald 17 September 1930). We have now caught up with Firth's Whiteley's project once again. It flourished for five years, you'll remember, until the rent-free deal collapsed in the summer of 1935. Since episode 6 I've had another look at Martin Leanse's comprehensive articles in Chess September 1994 and January 1995 about the formation of the National Chess Centre at John Lewis in 1939. Martin (who worked for John Lewis, and is active on the London chess scene), refers to the ESSC and writes "when Selfridge's obtained control of Whiteley's they closed the Centre [i.e. the facility for the ESSC - MS] because the expected profit from refreshment was not being realised". This implies that there was no 5-year time limit on the arrangement as I suggested in the last episode, and maybe Firth was indeed caught on the hop when the deal terminated. Certainly the July 1935 SCQ announcement of the end at Whiteley's said nothing about any alternative arrangements already in place. So what did happen next? Well, it will come now as no surprise that at the drop of one hat Firth pulled a rabbit from another and relocated ESSC HQ to Llandudno, to open there on the 1st November (as per announcement in the SCQ of October 1935, and a half-page ad in the BCM of the same month). The Falkirk Herald (9 October 1935) implied enthusiatically that it would be just like the good old days at the Craigside Hydro: though actually it was now to be at the Queen's Hotel, in an "excellent position facing the sea." The first Social Chess Week-end duly kicked-off on Friday 1st November 1935, and was reported in full in the SCQ (Vol 6, No 22, January 1936). There was a civic welcome for the players from a dignitary representing the local District Council. They hailed from various corners of Wales and even further afield: Manchester, Birmingham, and London. There was someone there from Goldaming in Surrey (ah ha!). Numbers were bolstered by "about forty members and friends from the Llandudno Chess Club." The visitors were assured by said dignitary that Llandudno promised an "exceptionally mild winter climate, and...freedom from fog and snow", adding that Mr Firth, "in his wisdom", thought it "the best centre for [his] purpose." So, there it is: that "strong player", Miss Strachey from Goldaming, Surrey - a fringe Bloomsberry, author of several novels (of dubious merit), biographer of Chopin, composer of lewd nursery rhymes, and part-time exhibitionist - beat the Women's World Champion (whisper it: while Vera played 19 others). Remarkable. For some reason the score of the game has not come down to us, but this fabulous photograph has: in Chess January 1936. Vera is on the left, Marjorie on the right - she won with the Black pieces, to boot. at Queen's Hotel, Llandudno in the course of the Social Chess Club's January week-end." In the last episode we made an educated guess that Marjorie must have been a member of a club where she might have honed her skills to something like tournament standard, and now we have an educated answer as to which one: the ESSC. Perhaps she had even taken advantage of tuition offered there by William Winter, or, more likely, Miss Menchik, World Lady Champion, herself. Thus Firth's ESSC emergency removal to North Wales set out on an upbeat, and promised much, not least because Firth himself was in permanent residence at the Queen's all winter "so players can be sure of a game" (BCM October 1935 p545). The BCM also reported the victory of "Miss Strachy" (sic - sadly), and revealed that the ambition of the club (i.e. Mr Firth's "purpose") was "to make Llandudno a centre for chess for the North of England, as Hastings is for the South". Whatever might have been Miss Strachey's feeling for snow, she played at both venues that season. The ESSC at the Queen's instituted a monthly competition for a Social Chess Cup (a familiar feature of Llandudno chess, as we've seen), which was won in November by B.H.Wood of Birmingham, no less; and a further weekend was flagged up for December, and yet more for the New Year. 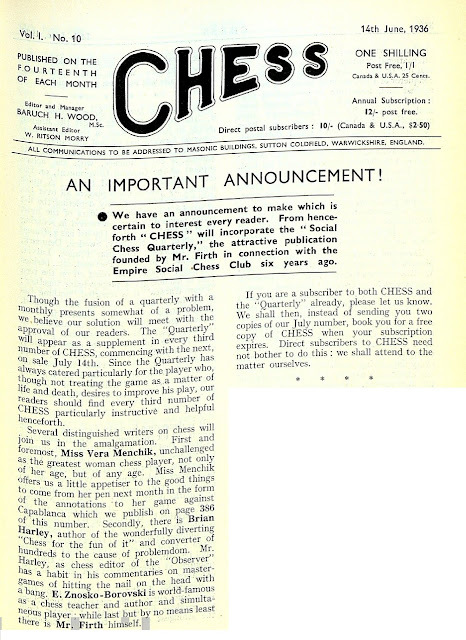 The Social Chess Quarterly for January 1936 appeared, as it did again in April. And then....nothing. The rest is silence. ....and without further ado Vera was to be found in the July issue of Chess (an article on the Bird's in fact), as was Brian Harley with his problems, and Firth with a his "Chess Nuts" (find-the-winning-move posers - some of them are quite hard to crack). There was a nominal "SCQ Supplement" of one page in that same July issue of Chess, so I suppose you could say that it continued publication - but I doubt that there were very many more. I rather think that ESSC @ Queen's didn't make it beyond the first winter, either. Back in the capital there were indications that the demise of the Whiteley's facility in the summer of 1935 had been a cause of consternation in the ranks, and that the ESSC's removal to Llandudno might leave the London oriented members high and dry. With or without Firth's blessing, a new club, "now known as the London Social Chess Club" (BCM November 1935) was in operation at the Porchester Hotel in Paddington, West London. It was "open every day of the week from 2-30 to 6-30....communicate with A.J.Duke". The December BCM reported its first general meeting on November 11th. "A. Hammond of Slough, the founder of the Club [and county champion of Buckinghamshire] was unanimously elected its first president...the members of the committee were as follows:- Mrs. Holloway (the well-known lady player), Miss Griffiths, E.M.Jellie and J.R.Austin." So E.M.Jellie makes another appearance in the chess-historical record, just in time to round off this episode of Played on Squares. He and Mrs Holloway were ESSC stalwarts, and are here keeping the "Social Chess" brand alive in a venue just a knight-hop from Whiteley's - an "Up Yours" gesture at the Selfridge's take-over if ever there was one. What can we say as a consequence of this two episode meander through the "Social Chess" experiment which was sparked off by the discovery of Marjorie Strachey's sensational victory in November 1935? Well, leaving Marjorie aside, there were a number of women active in chess organisation at the time, Vera Menchik among them. She seemed to be everywhere in British chess in the 1930s and 40s up to her untimely death in 1944: tournaments national and international, journalism, coaching etc. Her playing style and strength has been debated (just don't mention her performance in simuls...), and it was this that gave her a platform for her role in chess management - perhaps most significantly at the National Chess Centre at John Lewis. There appears to be a forthcoming biography of her, by Robert Tanner, I hope that it will cover this aspect of her chess career. She was omnipresent, but was she omni-influential? As for Firth's ESSC/SCQ project - in its Whiteley's phase - it was significant as a precursor to the NCC in 1939. It looks like Firth had no role in the John Lewis venture, or even that his advice was sought (though Menchik's experience with the SCQ/ESSC would have been invaluable to the NCC). The similarities are striking: an amenable - up to a point - retail partner; an individual membership model; a venue for club and congress events and for casual games. But the differences are telling as well, as if lessons had been learned from the ESSC experiment: the BCF was an active and contractual party in the NCC; it was unencumbered by a magazine; it wasn't premised on entry-level, "social" chess; it employed an independent manager - Miss Menchik - working to a Board. It got off to a flying start, but sadly, because of the Luftwaffe, we will never know if the National Chess Centre Mark 2 would have been any more sustainable in the long run than Mark 1. Circumstances were never propitious again for a Mark 3. So, thanks to Marjorie Strachey, minor Bloomsberry extraordinaire, we have had two more episodes of Played on Squares. Perhaps that really is it. But if anything more turns up, you will again be the first to know. Eminent Victorian Chess Players. Tim Harding. McFarland &Co. (2012). 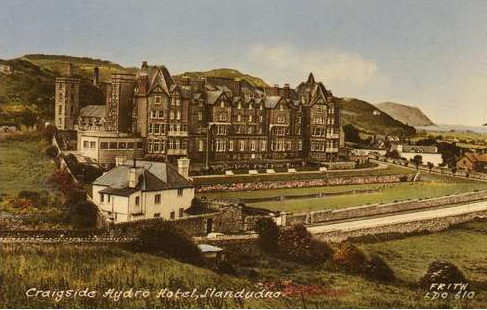 The Queen's Hotel, Llandudno still appears to be functioning,according to Google, which for an hotel set up in 1854 is good going. The Queens Hotel was built in 1854 by a Mr Owen Thomas, who then leased it to Miss Elizabeth Hersee. Upon taking residence she placed the following advertisement in Slaters Directory in 1856. "The Hotel is most commodiously arranged to meet the requirements of Families, Tourists and Invalids and E H hopes by every attention to their comfort. To receive the patronage which she now respectfully solicits. Hot, Cold and Shower Baths on premises. An excellent billiard table"
The Promenade was built to follow the sweep of the bay, whilst the town itself was built on a grid system which you can see on early maps of the Town. The Queens Hotel was then sold a short time later to a Mr William Griffiths of Llanrwst for £4000. In 1884 a new wing was added (the part on Clonmel Street which now houses the Embassy ballroom and Windsor restaurant). They invite comments on the hotel's history, so I'll let them know they had some chess back in 1935/6.